He’s been taking dance classes for much of his young life. And now, at 13, he’s poised for his star turn in the national tour of a Broadway hit. 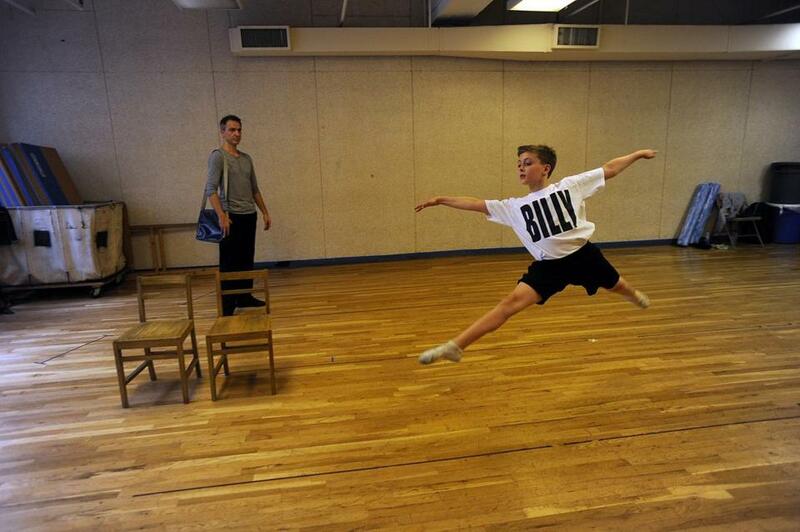 Noah Parets of Sharon rehearsing for “Billy Elliot’’ at Chelsea Studios in New York City. “I can identify with how [Billy] felt about possibly losing the chance to dance,” he says. NEW YORK — One morning in May, Noah Parets, who is 13, arrived at Chelsea Studios on West 26th Street for a day packed with classes. He would take ballet, choreography, tap, voice, acrobatics, and acting. The intense schedule had a single purpose: to prepare him for the title role in “Billy Elliot: The Musical,” alternating with three other boys on the national tour. Parets, who lives in Sharon, Mass., knows it’s a big deal. “I’m super-duper excited,” he said, heading to the ballet class. He and his mother, Robyn, stayed at a nearby hotel for the five-week rehearsal period here. At the end of every day, he also fit in three hours of tutoring, to keep up with school. “Noah quickly took to the gypsy life,” his mother said. “He feels every minute is worth it.” They would travel to three other cities before the show arrives this week at the Boston Opera House, where it will run Tuesday through Aug. 19. Based on the 2000 movie written by Lee Hall and directed by Stephen Daldry, the musical is directed by Daldry and has music by Elton John, a book and lyrics by Hall, and choreography by Peter Darling. It earned 10 Tony Awards in 2009. Sweet-faced, with light brown hair and a calm manner, Parets walked to the barre as the ballet class began. He bowed forward, sweeping his hand down to the floor, and returned to a standing position, his chin raised. “Feel your line,” instructed Jeff Edwards, the ballet and choreography teacher. “The people in the last row are probably the ones who most want to see the show. Project that far.” Parets straightened his back and curved his arms, a T-shirt emblazoned with “Billy” hanging loosely on his small frame. Next to him at the barre, Ben Cook, who was also preparing for the role, gave him an encouraging smile. Last summer, Robyn Parets took her younger son to see “Billy Elliot” on Broadway. “Noah loved everything: the singing, the acting, the dancing,” she said. “He was mesmerized. All he could talk about was auditioning when he knew there was a touring company.” As soon as they got home, they checked out the time and place of the upcoming auditions on the show’s website. His father, Mark, drove him to New York last September for his first “Billy Elliot” audition. The seven boys trying out were asked to do hip-hop and street dance as well as ballet and tap exercises, and eventually to sing the song “Electricity” from the show. “I gather myself and my thoughts before I go to do something big,” Parets said. “I came in confident and optimistic. I wasn’t really nervous. I relied on my dance background.” After the callback in January, he only had to wait a month to be informed that he had the role. He signed with the show for six months from his first performance. If he doesn’t grow too tall and his voice doesn’t change, he could get a contract for another six months. 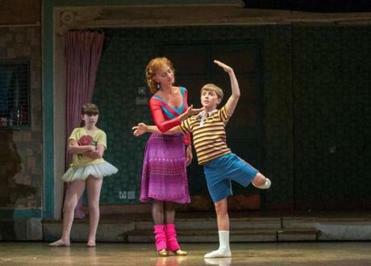 Noah Parets as Billy, Janet Dickinson as Mrs. Wilkinson, and Samantha Blaire Cutler as Debbie in "Billy Elliot: The Musical." Huffing and puffing when he finished, Parets searched in his bag for a bottle of water and slid down on the floor. “This role is like running a marathon while playing Hamlet,” Edwards said sympathetically. Valerie Gladstone can be reached at vgladstone@gmail.com.